Like many people who get summoned to jury duty, Jacob Clark didn’t want to go. But unlike most people, he had a legitimate excuse — he’s 9 years old. “I was like, ’What’s a jury duty?’” Jacob told the Cape Cod Times in response to his summons to appear in Orleans District Court on April 18. His dad called the jury commission office to find out what happened. It turns out that someone apparently had typed 1982 for the Yarmouth third-grader’s birth year instead of 2002. 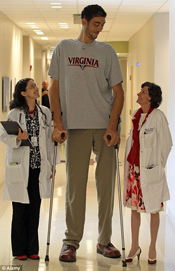 Thanks to the ministrations of doctors at the University of Virginia, the tallest man in the world has stopped growing. “He’s done very, very well, fortunately,” said Dr. Jason Sheehan, a UVa brain surgeon who treated Sultan Kosen, the world record holder for height. Kosen, from Turkey, was already 8 feet 3 inches tall when he came to Virginia in 2010 so UVa doctors could treat a tumor in his pituitary gland that was causing excess growth hormone and gigantism. Previous, failed attempts to halt Kosen’s growth made the UVa team’s job all the harder, Sheehan said. A UVa doctor put Kosen on medication to help balance his hormone levels. Sheehan used a tool called a gamma knife to attack the tumor, which was too deep in Kosen’s brain for conventional surgery. The technique used focused beams of radiation to target the tumor. Kosen's hands are also the largest in the world, measuring 10.8 inches. 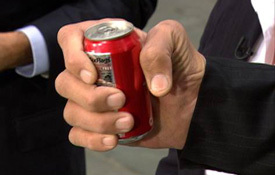 Pictured here holding a soda can. Three months ago, Turkish doctors confirmed that Kosen had stopped growing. He’s not going to shrink, but doctors said that if he’d continued growing he’d have been at even greater risk for joint and organ problems caused by his enormous size. The treatment will be mentioned in Guinness World Records. — thanks to a transformer fire that knocked out power to a large part of Boston recently. The Capital Grille donated 2,500 pounds of raw steak, worth $20,000, to the zoo after the prime cuts were without refrigeration long enough to violate health rules. But they were declared fine for the two tigers, one lion and one leopard who shared them. This is why it’s a bad idea to commit identity theft in a small town. A would-be crook was busted in Lancaster County, Pa., after he tried to buy goods at a convenience store with a stolen credit card and the clerk recognized him. Also, the stolen card belonged to the clerk’s mom. Cops probably aren’t too anxious to get their hands on this stolen property. Thieves snatched a 500- pound beehive packed with 5,000 of the angry buzzers from outside a Houston restaurant, which used the insects to make honey. Big Brother is watching you — pump gas. Authorities in Britain have instaled “smart” gas pumps throughout the country that will refuse to dispense gasoline if a car is not insured. A camera at the pump will scan the license plate and check it against a database of insured vehicles before the fuel can flow. From The Boston Herald and The NY Post.